This chapter provides an introduction to the concept of sustainability, outlining the differences between sustainable development and more radical understandings of sustainability. It also highlights the discursive and networked basis of sustainability. The chapter defines everyday life, explaining how it is a temporal, spatial, and mediated phenomenon. The concept of lifestyle is explained as both an important feature of modern consumer life and also more broadly as a strategy in reflexive identity formation. An overview of the merits and deficiencies of ethical consumption practices is provided. 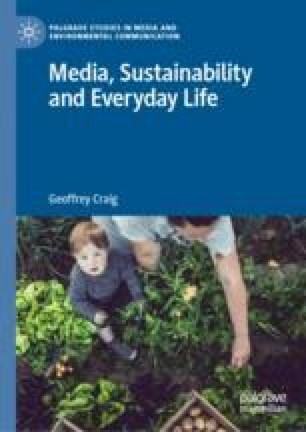 The chapter also examines the way that sustainable everyday life can be a marker of high cultural capital and expressive of a particular ecological habitus. Law, John. 2003. Notes on the Theory of the Actor Network: Ordering, Strategy and Heterogeneity. www.comp.lancs.ac.uk/sociology/papers/Law-Notes-on-ANT.pdf. United Nations. 2019. Sustainable Development Goals. https://www.un.org/sustainabledevelopment/. United Nations Development Programme. 2011. Human Development Report 2011. Sustainability and Equity: A Better Future for All. http://hdr.undp.org/sites/default/files/hdr_2011_en_summary.pdf.